Kind of a big deal wedding on...Friday, wahoo! We should take time off work. My excitement is due in part to my mom, who has always been a fan of England's royal family. She was living in London when Diana got married and even camped out for a couple days to ensure a front row view of Diana heading to the church. That was a real time investment for history, Mom. What a fairytale. I wish I were friends with Kate like I wish I were friends with the Olsen twins. That was the name of my Easter bunny one year. What a name. I literally got a rabbit. The tiny, grey little puff was so soft and adorable, I couldn’t help constantly cuddling with it. I’d rub her face with mine, tote her round everywhere, and squeeze her to the point of smothering her. This lasted for about an hour until my eyes swelled and I had hives all over. Hippity Hop had to be loved from a distance after my newfound allergies became very apparent. So, my younger brother took over holding and caring for her. He couldn’t stop touching her, either. But it wasn’t the soft play of a little girl. It was the squishing and prodding of an even littler boy. He’d rub Hippity Hop and his hand would find her face, and he’d touch her beady little eyeball. He’d decided she loved her tummy rubbed like he’d seen our cousins’ dog enjoy, so Hippity Hop spent a lot of time on her back. Eventually my brother found her “belly button”…yeah. Think about that for a minute. He tickled Hippity Hop’s tummy and poked that belly button until he was discovered. No wonder Hippity Hop’s eyes were so huge all the time. My brother was the kind of little guy that would have been mortified and disgusted and probably scarred for life had anyone told him Hippity Hop’s belly button was not, in fact, a belly button, so we just discouraged the belly rubbing all together. “Bunnies really don’t like you to touch their stomachs. Or eyes. Or in their ears. And especially their belly buttons.” We promoted holding Hippity Hop on the shoulder, right-side up, stomach-side down. After her debut in family pictures with all my cousins (and why I was holding her in family pictures when I was clearly allergic to is beyond me), Hippity Hop met her untimely demise. I was told she ate some bad grass outside. I don’t doubt it was a suicide attempt, and probably not the last attempt many a future Easter bunny will make. This post was meant to proclaim my love and devotion to Easter candy, but the title gave me flashbacks of bunny “belly buttons.” Just another reason my brother is so great. Anyway, I count down to Easter candy all year long. It’s always yummy, lots of chocolate, pretty colors…ahh. And the mother of it all: Cadbury Eggs. No, not the little kind in the bag. The best BEST BESSSST are the big cream filled eggs the Cadbury Bunny lays on the commercials. My many years of seasonal Cadbury Egg hunting have led me to this little bit of expertise I’d like to share with you. 1.) First of all, you have to buy them the Monday after Easter to stock up. They are on sale, but don’t last for long. Luckily, there is no major holiday grocers are overeager to clear out their shelves for, so they’ll be there for a couple days, but the good stuff is gone quick. 2.) Second, you have to ration them for the rest of the year. You can’t get those all the time, you know. I usually buy a supply so I can eat 2 a month. 3.) Once a few months have gone by, Cadbury Egg’s beautiful cream centers tend to get a little less creamy. This issue can be expected come Halloween, so be prepared to freshen them up. Microwaves are for amateurs. Way too unpredictable. The best way to refresh a stale-ish Egg is to either leave it in the car in the sun (monitored), or in the bathroom while you are taking a steamy bath or shower. Or, just in the shower… I secretly love eating chocolate in the shower. Hehe. The cat came out of the bag after I got married and Brian found chocolate and popsicle wrappers in there. Hehe again. 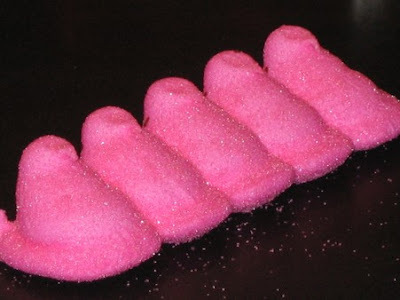 Another great Easter candy: PEEPS! It’s more for laughs than taste. They aren’t that good, and I usually just eat their heads. Why? Check it out in the store next time you are at the store. It’s HILARIOUS. Misprint Peeps…there are usually just two kinds: Blind Peeps, and Cyclops Peeps. Either their eyes get printed on the side of their head, or, rarer, they get missed with the eye part all together. I LOVE IT. Seeing Cyclops Peeps staring at me from inside their packages cracks me up every time. Although this wasn’t the case when I was younger and would find them waiting for me in an Easter basket: I’d open them, and they’d just sit there in a death row line, all stuck together, staring out of a lone eyeball on the side of their heads. Stop looking at me, Cyclops. So I’d eat their heads.